While Brewers fans chew on the midseason BaseballProspectus Top 50, BPMilwaukee will continue to augment that list with looks at “up” and “down” prospects in the system. Yesterday’s feature included some of the prospects with highest regard in the system, so today’s feature turns to depth. One cannot overlook the system depth, even if one wishes to praise a system for its superstar potential; in building a contender and biding the time required to complete 162 games, system depth is a crucial aspect of a farm system. The picks include BaseballProspectus scout James Fisher and Assistant Editor & Staff Writer Kyle Lesniewski. Recently, some of the most intriguing arms in the Brewers system received promotions. #Brewers have promoted RHP Angel Ventura to @BiloxiShuckers and RHP Freddy Peralta to @BCManatees. This year’s A Wisconsin affiliate has simply been stacked with arms, so much so that one might have forgotten about Marcos Diplan. Within the system, Miguel Diaz and Jon Perrin stormed the stage (although these RHP are both interesting for different reasons) as homegrown arms, and Freddy Peralta (also in Brevard County now) stepped forward to put a face with those names returned in the Adam Lind trade. So, Diplan stood as one of the earliest “rebuilding” trade returns in Milwaukee’s system, but the teenager struck out 89 of 295 batters faced. Questions about Diplan’s size and secondary stuff at times lead one to expect a bullpen profile for the righty, but those huge strike out profiles make even that outcome appear more exciting. Trey Supak was something of a lottery ticket return as a part of the Jason Rogers trade, even if he ultimately has a frame and some tools worth projecting. Recovering from a previous injury, Supak faced a potentially brief 2016 campaign, but the righty has impressed by making quick work of R Helena: an 11 strikeout / 1 walk campaign preceded Supak’s promotion to Wisconsin, where the 20 year old will look to prove himself against older, full season talent. While Diplan and Supak have completely different frames, development patterns, and injury histories, it’s somewhat tempting to place Supak’s risk category in the same realm as Diplan: you’ve got to dream on the tools as a starter, but there’s still a lot to like even in a relief profile. In the season of Junior Guerra’s stunning MLB success, non-linear developmental patterns should become an area of further analysis. While Angel Ventura’s path has not meandered in the same way that Guerra’s did, the righty spent three seasons in the Brewers Dominican Summer League before coming to the United States. It’s easy to dismiss Ventura as an “old” prospect in some sense, then, but the righty has consistently posted solid strike out rates in both A Wisconsin and A+ Brevard County. Now, while he’s working in AA Biloxi, the 6’2″ prospect continues to serve as underrated organizational depth, this time only a couple of steps away from the MLB. While all eyes are rightfully on Orlando Arcia to officially judge the retooled Milwaukee International system a success, Ventura could also serve as a success story and a lesson about patience in player development. Jon Perrin, A+ Brevard County (Kyle Lesniewski): While Brewers fans might rightfully focus on the aggressive assignment for RHP Cody Ponce out of the 2015 draft, his 27th round counterpart Jon Perrin has forced his way to the same level in 2016. Kyle Lesniewski previously featured Perrin at BPMilwaukee, tempering expectations from his A Wisconsin dominance by noting the righty’s age and rotational profile. Now, with eleven games under his belt in Brevard County, the extreme strike out / walk profile looks good (19 percent / five percent). While it’s tough to lay off of the Mike Fiers comparisons given Perrin’s size, depth status, and draft profile, one must watch the righty’s flyball rate, as that may be the most important comparison and aspect of Perrin’s game to define his advancement. Franly Mallen, R Helena (Nicholas Zettel): Before there was Gilbert Lara, Milwaukee’s big International smash, there was Franly Mallen, a much less hyped but arguably as interesting prospect for the Brewers system. When Mallen was signed, reports did not necessarily highlight a standout tool, although some scouts reportedly looked for projectable power. 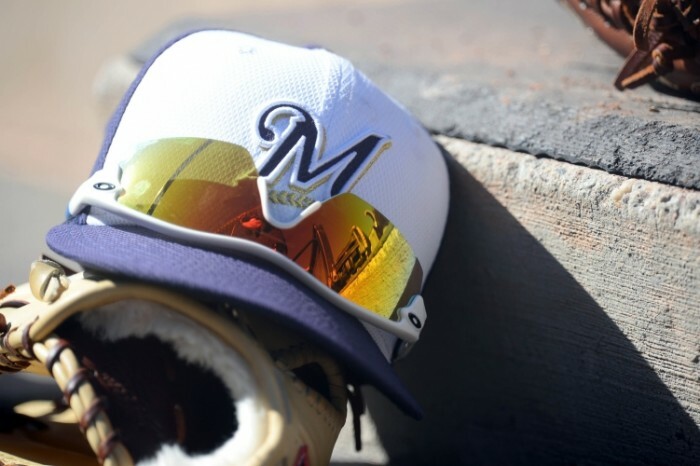 Last year was arguably a type of breakout for Mallen, in the sense that he received one of the most aggressive promotions out of the Dominican Summer League from the Brewers front office. Mallen has done nothing but rake in Helena, boasting TAv of .366 and .311 (at age 19, now, no less). The youngster is already off of shortstop, which could speak more to the jampacked shortstop position in the system than Mallen’s glove, but it remains to be seen if this move is permanent. Even so fans can salivate at the Javier Betancourt / Wendell Rijo / Isan Diaz / Franly Mallen potential pipeline at second base, if that move is permanent. Nate Orf, AAA Colorado Springs (James Fisher): At every turn, when the Brewers system improved in 2015, most of the hype went to players like Orlando Arcia and Jorge Lopez. But Nate Orf, an undrafted free agent signed by the Brewers in 2013, also carried his production to AA Biloxi last year, earning a spot in the Arizona Fall League. James Fisher called Orf a “utility guy that can really hit. Under the radar guy that will be a big leaguer, [and] deserves some recognition.” True to form, Orf is posting a .294 TAv while playing second base, third base, and shortstop in Colorado Springs. Should the Brewers make as many trades as one might expect during the deadline crunch, fans and analysts should look out for the 26 year old Orf in Brewers blue, solidifying the multifaceted infielder as a true Bruce Seid era success story. Gilbert Lara, R Helena (Nicholas Zettel): It seems roundly unfair to place Lara in this category (if anything, it’s an argument against prospect bonus hype): the 18 year old only has instructional ball and 344 plate appearances in the USA as his professional experience, and has a long way to go to reach his toolsy projections. BaseballProspectus ranked Lara fifth in the Brewers system due to his immense talent, with power being the calling card here. Those tools simply have not shown up in games yet, as Lara works to define his plate discipline and approach. Wei-Chung Wang, AA Biloxi (James Fisher): Don’t look now, but just as soon as we brainstormed this feature, Wei-Chung Wang looks to be on another second half surge. James noted that Wang’s stuff is backing up, and also noted that the strike out / walk profile is not ideal. Once again, Wang has his work cut out for him, as the southpaw will arguably need to stabilize his up-again, down-again organizational status as he tries to convince the Milwaukee front office to protect him from the Rule 5 draft this autumn. Clint Coulter, A+ Brevard County (Kyle Lesniewski): Last year, some fans and analysts clamored about the placement of Coulter within year-end prospect lists, as the catcher-turned-right fielder’s stock fell. The rough times in Brevard County continued in 2016. This time around, one might point to Coulter’s notably below average competition (.673 opposing OPS, placing Coulter’s competition ahead of only 25% of Florida Southern regulars) and age as additional question marks for the prospect. The silver lining is that Coulter’s bat improved in June and is currently solidly hot in July (.311 AVG with five extra base hits in 50 PA), so hopefully Coulter has a redemption storyline on target.